Cloud migration is the process of moving your data, applications, and other elements to the cloud. However, the path to the cloud can be long and painful without proper planning and execution. By following Tidal Migration’s six discovery layering techniques, you will be migrating to the cloud with ease! 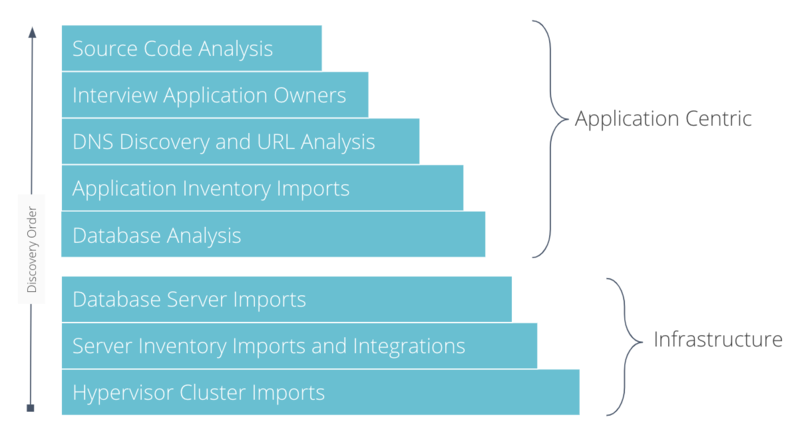 Tidal Migrations' layered approach to application discovery, for cloud migration. If your already have some data collected in spreadsheets, the first step to begin your cloud migration project is importing a spreadsheet of Virtualization Clusters, Servers, Databases Instances and Applications. Tidal Migration’s importer will guide you through mapping your columns to our fields, create your own fields and even make associations between dependencies if you have captured these. NB: See additional ways on importing your applications and servers in the API docs. Once you have imported your data, you can begin to synchronize your inventories via tidal sync servers. Tidal sync supports many server inventory management tools such as VMWare and HyperV with more possible via scripting (ask us). If you have VM Ware’s vSphere, tidal sync vsphere will handle everying with just read-only credentials required. It is useful to setup a cron job or Windows Scheduled Task for this process, and we recommend synchronizing your inventories no more than once per day. This will keep your resource inventory up to date and show you usage trends over time in the Analyze feature. Tidal Migrations provides you with a simple and effective way to gather machine statistics (RAM, Storage, CPU allocations and usage) from Windows and UNIX/Linux server environmens. In Windows, we use WinRM to Invoke-Command across your servers, and for *NIX we leverage ansible. Both of these approaches output JSON which is securely sent to your Tidal Migrations instance using the tidal command. Checkout this guide for a quick and clean approach to gathering server usage statistics. See the machine_stats repository for more implementation details. NB: Feel free to fork the repo and modify to suit your needs, or to show your security team and give them comfort. This extensibility and transparency is core to our approach. a.) The initial step in your cloud journey is discovering what you have. It can be hard to remain informed about all the domains and applications hosted in your environment, which is why we created the tidal discover command. With your customized Discovery Plan you can obtain both private and public domains within your datacentres in under 60 seconds. This tidal-tools guide contains examples for creating your own Discovery Plan to scan multiple networks and DNS services. b.) With a list of domains in hand, the next step is to analyze the applications hosted on these domains. tidal analyze will fingerprint the technology on both your internet sites and intranet applications behind your firewall in seconds, without needing to install agents. Whether you have 1 or 1 million end points, Tidal Tools centralizes the data gathered into our platform for you to analyze further and plan with, simplifying your application centric cloud migration. For detailed information and steps on analyzing your domains, be sure to checkout this guide. Analyze all of your databases in minutes and measure the migration difficulty. After running tidal analyze db your_config.yml against your databases (see guide), you will understand which database features in your Oracle or SQL Server installations make it difficult to adopt cloud-native database offerings and also identify which applications are connecting to your databases. With over 100 unique characteristics considered, comparisons are made with the data platforms available in the cloud(s) you are migrating to which provide you with data-driven insights for planning your cloud migration. Follow the steps in the guide, and you will be able to quantify the difficulty in migrating your database from Oracle to PostreSQL; or from SQL Server to AWS Aurora etc. Finally, to find the applications which will migrate more easily to cloud-native technologies you can analyze your source code and rank your applications by Cloud Readiness. Doing this for each of your custom applications which have a Transition Type of Refactor or Replatform will give you the data needed to prioritize your application migrations. To analyze your source code, you need the Application ID, to be logged in with tidal-tools and a copy of the source code checked out. You can find the Application ID in the URL bar when looking at an application. e.g. if I’m loking at an application in Tidal Migrations, the URL will show https://demo2.tidalmg.com/#/apps/111 Here, 111 is my Application ID. tidal analyze --app-id 111 . To find additional information about this feature, visit the guide on analyzing your source code. Immediately getting an idea of the size and scope of your migration is critical to successful cloud migration planning. Our goal at Tidal Migrations is to provide you with useful information within 60 seconds of signup, and letting you layer in additional information from discovery sources as needed. You do not need to spend weeks and months installing discovery systems to start planning your cloud migration any more. Not yet a customer? See tidalmigrations.com and Try For Free.